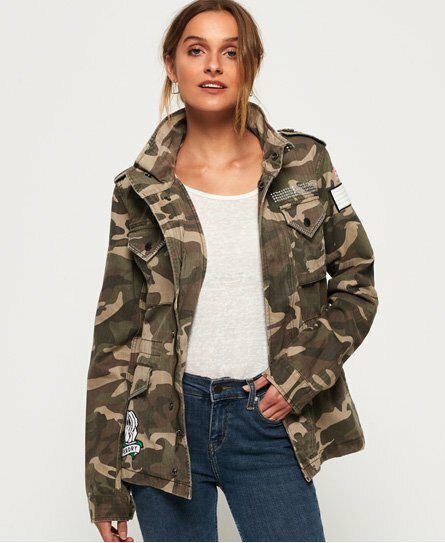 Superdry women’s Rookie embellished military jacket. This jacket features a zip and popper fastening, six front pockets and a drawstring adjustable waist for the perfect fit. The Rookie embellished military jacket is decorated with a faux zip on the collar, rhinestone detailing on the pockets and collar, and a selection of applique badges throughout. This jacket is completed with shoulder epaulettes, popper fastened cuffs and a Superdry logo patch on the pocket. Style this jacket with skinny jeans and boots for an on-trend look.